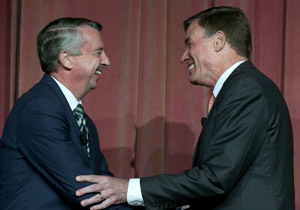 By Nancy Madsen on Monday, October 13th, 2014 at 2:53 p.m.
Ed Gillespie, left, and Mark Warner will debate at 7 p.m.
PolitiFact Virginia is ready for the third and final U.S. Senate debate tonight between incumbent Mark Warner, a Democrat, and Republican Ed Gillespie. We'll be live fact-checking the hour-long debate, scheduled to begin at 7 p.m. Our tweets, from @PolitiFactVA will help viewers quickly discern when the candidates are telling the truth or twisting the facts. The debate, organized by the League of Women Voters and AARP Virginia. It will be televised and streamed live by WCVE PBS, WTVR-TV, and C-SPAN. We suggest that you make it a two-screen affair: watch the live-streamed event and follow us on your Twitter feed. And keep following us after the debate -- we’ll have new fact checks on this race up to Election Day on Nov. 4. If there’s something you would like to see fact-checked, email us your suggestion.